Locusts, grasshoppers and crickets are only a few of the insects ye may eat. Most insects are not only edible, but high in vitamins and protein and cholesterol-free. 80% of the world’s population parttakes of this ubiquitous and inexhaustible food resource with relish. The other 20% is filled with repugnance at the idea. Cockroach cupcakes? Scorpion saute? Pill bug pie? Yikes! Actually, the pill bug, Armadillidium vulgare, a.k.a. the roly-poly, is a crustacean closely related to our favorite seafood, the shrimp, and tasting much like it. It makes a good transition for the sqeamish to other arthropodic delights and the quickly widening world of entomophagy. Insects are now served by many world-class restaurants. A trailblazer in arthropod haute cuisine is Rene Redzepi, owner of the Noma restaurant in Kopenhagen, Denmark. Noma was ranked best in the world for 4 years in a row by Restaurant magazine and has 2 Michelin stars, attesting to the lack of ickiness in its fare. An offshoot of the restaurant is the Nordic Food Lab, established by Chef Redzepi to research new ways of preparing insect-based dishes. Closer to Tucson is the Oaxaca Restaurant in Phoenix, which serves chapulines, a traditional dish in Mexico. Chapulines are a kind of grashopper fried to a crisp deep-red with chili and a bit of lemon. Myammy! Another traditonal Mexican dish is jumiles, also – and somewhat derisevely – known as stink bugs. They taste like cinnamon. Moreover, they are said to have a tranquilizing and analgesic effect. On the bottom of a bottle another pain-reliever, tequila, should be an agave worm as proof that the liquor is strong enough to preserve it, as well as proof of the machismo of the one who empties the bottle. In addtion to that, these chilocuiles, which can grow to over 2.5 inches, have been a prized delicacy, either fried or raw, from the time of the Aztec emperors. Medicinal properties have been attributed to insects in many cultures throughout the ages and modern medicine is now taking them seriously too. The Chinese Mountain Black Ant, traditionally believed to have anti-aging properties, now figures prominently in the search for a cure for cancer. Products derived from the honey bee have been show to boost the immune system and fight a host of diseases associated with it, from allergies to pancreatic cancer. Honey bees are also quite good to eat, as they feed only on honey, pollen and royal jelly. But perhaps it is better, in view of the dwindling supply, to let them be. Plenty of others to choose from, and many abundant in our neck of the woods: ants, june bugs, tomatohorn worms, scorpions, even coackroaches can be made into fantastic dishes. Not only are insects good to eat, but eating them is also good for the environment. For the same amount of nutritional value, insects use as much as 80% less water than cattle. Unlike cattle, their carbon footprint is negligible and they do not emit methane, a known greenhouse gas. And if you still think you’ll never eat bugs except when riding your motorbike without a helmet: check out the FDA’s Food Defect Action levels, describing, quote, the levels of natural or unavoidable defects in foods that present no health hazards for humans. They’re full of bugs. The University of Arizona’s Department of Entomology hosts the annual Insect Festival on Sunday, October first, from 10 am – 3 pm at the UofA ENR2 building, 1064 E Lowell St .
Dr. Goggy Davidowitz, associate professor of Entomology, will give a presentation on bug grub from 10:45-11:00. 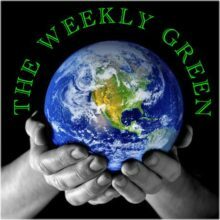 The Weekly Green is a KXCI mini-program on environmental topics from Southern Arizona and the rest of the universe. The program airs Mondays at 5:55 PM, Tuesdays at 4:55 AM, Wednesdays at 9:55 AM and 5:55 PM, Thursdays at 7:55 PM and Saturdays 9:55 AM. Barring circumstances, first airing is usually Wednesday at 9:55 a.m.